In the year 1350 AD the black plague struck France. The mortality rate varied from place to place from around an eighth to two thirds of the population. Often whole families or towns were wiped out. It was the worst catastrophe the world had ever seen. The terror that people naturally felt in the face of such a calamity was intensified by their absolute helplessness to do anything relevant about it. So there we have the 14th century theory of the plague. The Jews were poisoning the water. It should be noted that Guillaume interprets this as a defiling of what is pure, and this, of course, was how he understood the effect of the Jews in general. They defiled the purity of the dominant community. The Christians who died with them in shame were those who collaborated or sympathized with the Jews. Guillaume’s narrative is offered as a justification for the slaughter of the Jews. It is a sobering thought that the Christians who participated in the slaughter of the Jews in the middle of the 14th century genuinely believed that they were acting on behalf of purity, decency and goodness. Gauillaume’s justification of the slaughter becomes for us a cautionary tale. It suggests that the great collective atrocities of humanity were generally motivated by a profound sense of righteousness – often accompanied with the conviction that the gods themselves ordained the unspeakable cruelty inflicted on others. One must especially beware the idea of “purity.” An immeasurable amount of pointless suffering has been perpetrated on people in defense of that dubious ideal. And he [Aaron] shall take the two goats, and present them before the lord, at the door of the tabernacle of the congregation. And Aaron shall bring the goat upon which the Lord’s lot fell, and offer him for a sin offering. But the goat, on which the lot fell to be the scapegoat, shall be presented alive before the Lord, to make an atonement with him, and to let him go for a scapegoat into the wilderness. Here we have something a bit different than the example with which we began. In this ceremony the goat is understood to be innocent, and is chosen randomly. The sins which belong to the people of Israel are projected onto the goat, which is then driven out of the community, into the wilderness to wander until he dies. Here the persecutor understands that he is guilty and the the scapegoat is innocent. This is a more conscious form of scapegoating, and is for that reason less lethal. Only a goat ends up being sacrificed. In psycho dynamic terms, scapegoating constitutes a group defensive manifestation, a shared fantasy or act, designed to deal with unacceptable emotions, such as hostility, sexuality and guilt. Scapegoating is a strategy used by a group to ward off real or imagined threats to its integrity and safety by imputing an irrational degree of blame for the dangerous circumstances to an individual member or subgroup, which is then attacked and ostracized. There are five essential elements in this definition which need some clarification. First, scapegoating is a social strategy, not simply a matter of one individual blaming another one for something, and it must be understood in terms of group concerns and dynamics. Second, scapegoating is always focused on a real or imagined threat to the group. The wide variety of dangers that might be at issue is what gives rise to the feeling that we may not be dealing with a single phenomenon at all. The danger may have to do with forbidden or stigmatized ways of feelings that threaten the identity of the group and its members, and must therefore be disowned through projecting them onto a scapegoat. The threat may have to do with interpersonal hostilities that threaten the cohesion of the group. It may be that forces of change or social evolution threaten the group by bringing into question its identity or coping mechanisms . The group may be threatened by a plague, or by an external enemy, or simply by a humiliating event. Granted these are very different kinds of danger, but if the way of dealing with these threats involves projection, irrational blame, and an attack on the individual or group blamed, with an ultimate aim of casting him or her out, then I think we dealing with variations on a common dynamic that can very appropriately be called scapegoating. Third, there is a degree of irrationality in the degree of blame that is cast on the person or group chosen to be scapegoated. This is not to say that the scapegoat is always innocent. There may be something the scapegoat does that draws the fire. The scapegoat may even do something that is objectively a threat or a problem to the larger group. Or the scapegoat may be quite innocent. For the phenomenon to qualify as “scapegoating” there must simply be an exaggerated or unrealistic assessment of how dangerous and guilty the scapegoat is, and as a consequence, an overreaction to the situation. Fourth, in scapegoating we always find a degree of demonization. 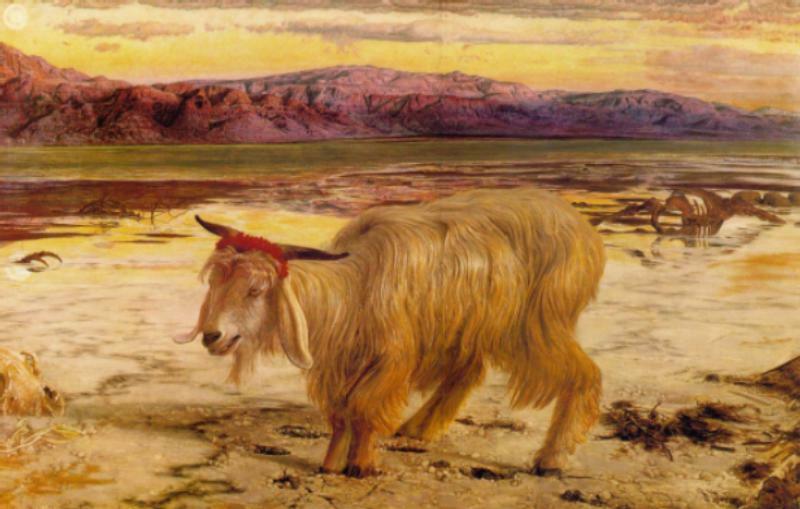 The scapegoat is not quite fully human in the eyes of the scapegoaters. Fifth, the ultimate aim of the scapegoating is to cast out the evil through ostracizing the scapegoat. He or she must be driven into the desert. In these days the desert is likely to be a prison or a mental hospital. Or perhaps it takes the form of deportation. In many cases it is simply a matter of quiet ostracism. The common dynamic is simply that the group rids itself of the perceived threat to its existence or wellbeing by driving the scapegoated person or group into the desert. The specifics vary from culture to culture, but any deviation from the the established order and the expected pattern of behavior will always be a source of anxiety. Order and specifically the status quo – is established by divinity and disregarding it will bring down the retribution of the gods. The enemy with which the collective theory of scapegoating is concerned is always within the city walls. He is the foreigner or the minority that we have permitted to live within our borders. He is the eccentric within our town. He is the disobedient son within our house. He is the rebellious impulse within our own soul. He is whoever or whatever that is rebelling against the mandated order. The inner enemy always has the capacity to defile – to destroy the purity of the collective self. He or she must be therefore be excluded from the rest of the population. Excluding the enemy when they other people is fairly easy. Other people can simply be burned, hanged or beheaded, as in our first example. Or in more civilized times they can be sent to prison, expelled from the country or simply ostracized. But if we are dealing with an enemy that is lodged in our own souls it is a far graver matter. If the structure of our desire is not what the gods ordain, what then? This structure of desire must be projected onto a scapegoat who is then driven into the wilderness. In Jungian terms, a structure of desire which is not socially acceptable, and which is consequently a source of embarrassment, shame and guilt when we become aware of it, becomes the kernel around which the shadow develops. The shadow is all that is within us that we consider unacceptable. It includes weaknessas well as disgusting or unacceptable wishes. The shadow may be so common as to take on a collective aspect. The boy masturbating under his covers to some delicious fantasy is the shadow of the little upstanding citizen sitting obediently in church or waving his hand in the air at school to gain recognition by answering the teacher’s question. This, of course, is a shadow common to all boys. When scapegoating is concerned with disowning unacceptable feelings, it will always concern feelings that are sufficiently common to warrant collective action. The dynamics of scapegoating may be embodied in rituals that take place on a regular basis in a community. After all, we are always violating the mandates of the gods, in our desires if nowhere else. But whenever a people finds itself in a crisis – whether it be a plague, an economic disaster, a humiliating situation, a political danger, or a social upheaval – the dynamics of scapegoating will tend to be especially intense, uncompromising, and lethal. This disaster is coming upon us because we are impure. It becomes an urgent matter that we purify ourselves inwardly to prepare ourselves to meet the enemy. In Sophocles Oedipus, it is noteworthy that the play opens with a plague in the city of Thebes, which was apparently caused by the unintended impiety of Oedipus, who unwittingly killed his father and married his mother. The scapegoat that Oedipus must find and drive into the wilderness is the murderer of the former king, Laius. This of course, turns out to be Oedipus himself. All the themes we have identified as underlying the scapegoat theory of why things go wrong are included here. We have a catastrophe, the plague, brought on by impiety. And this catastrophe can be cured only by identifying the guilty one, and driving him from the city into the wilderness to die. catastrophes are caused by people or groups who defile the collective life with some kind of impurity. The means to protect the community from the threatened catastrophe is to purge the community of its impure elements. I am not suggesting that these beliefs are clearly articulated in the minds of those who carry out the scapegoating functions of a society. But if we listen to the talk, and read the writings, of those who are justifying their attacks on scapegoats, we can discern an underlying understanding of why things go wrong and what must therefore be done. It is this implicit belief system that underpins the understanding of life that leads to scapegoating. I have simply tried to make explicit in the three points listed above. Both the dynamics and the beliefs associated with scapegoating are well illustrated by an example from 19th century Europe. Throughout the greatest portion of that century a peculiar and hard to explain moral panic about masturbation dominated the minds and behavior of people and led to a variety of dysfunctional counter-measures. Doctors, educators, and the clergy were in agreement on the subject. Masturbation caused a huge variety of mental and physical misfortunes, ranging from insanity to almost any physical illness or disability one could name. It was a sin against God, and threatened to cause the degeneration of the species. Given what was at stake, no measures to deal with the matter were too extreme. Given the seriousness of this crime, it was natural that Dupanloup recommended “an immediate and merciless repression” of the practice whenever a boy was caught. Otherwise this “horrible wound will spread and ravage everything.” He boasts that he “once had to advise the head of an establishment that the evil had invaded, to send home sixty nine students; he did it, and saved his house; and it is today one of the largest and most prosperous educational establishment in France.” ( Stengers, pgs. 4 and 5). One suspects that if they actually had caught and expelled every student who was guilty of the practice, they would not have remained one of the largest educational establishments in France for long. Dupenloup’s school was threatened by an act that violated the divine decree. The sinful ones,– the masturbators, defiled the entire school by their private acts, and were seen as a threat to civilization itself. I suspect that the underlying threat that the warriors against masturbation were struggling with had to do with a cultural upheaval. The authoritarian, patriarchal and puritan understanding of life was losing its grip – its strangle hold if you will on society. The child’s most common expression of sexuality became the battle field for this struggle. The end of civilization as the Dupenloups of the world understood it was, in fact, inevitable. And of course, the solution, the expulsion of the polluters, was typical of the scapegoating dynamic. A very important aspect of scapegoating can be seen in this example. Scapegoating prevents learning. The scapegoaters cannot learn because they think they already know. There is no need to listen to the scapegoats. Indeed, to do so would be to expose themselves to polluting thoughts. If they had listened to the boys I am sure the good doctors and educators of the time would have learned that these boys “abused themselves” because it felt good and because it comforted them in a world that was often lonely and harsh. Or if they had been able to listen in at an adult masturbators anonymous group they would have learned that none of the dire consequences that were predicted to flow from masturbation actually came to pass. But, as always, the narratives of the scapegoats were excluded from the public discourse. And two centuries after this moral panic got under way, we have still not learned. Not many years ago, Joycelyn Elders, the Surgeon General of the United States lost her job for the modest proposal that masturbation be mentioned in the public school’s health curriculum. Still it too shameful a thing to mention. As one closely observes the dynamics of scapegoating, a peculiar ambivalence toward the scapegoat is frequently noticed. This may be in part because the scapegoat is perceived as being very powerful. After all, he or she has the capacity to pollute the collective life of a whole group. Because of this power, the scapegoat may also have the capacity to bring healing. But there may be a deeper cause for the ambivalence that is felt about the scapegoat. The scapegoat is a shadow figure. There is a peculiar ambiguity about the shadow. The shadow may represent simply that which we don’t find attractive about ourselves, or that which must realistically be kept under control if we are to live in a civilized manner. But the shadow may also contain energies, impulses, and longings that have been rejected by a rigid, arbitrary or puritanical consciousness that does not understand the requirements of wholeness. In this case the shadow figure comes to represent exactly that which must be incorporated into conscious and social life if wholeness is to be regained, or if the the evolution of consciousness is to continue. In this case the shadow figure may indeed threaten the status quo, but do so as a prerequisite for ushering in a new individual and collective way being in the world. In this case the shadow figure, who is at first persecuted, and then scapegoated, eventually becomes the healer or the savior. This is the guiding myth of the synoptic gospels. Understood in this way, the Christian story is truly a redemptive myth. The brutal persecution of the Christians in the Roman Empire is one of the best known examples of scapegoating. It is ironic that groups who have been subjected to scapegoating when they are politically weak sometimes become ruthless scapegoaters when they gain power. The practices of Christians during the Inquisition of the 14th and 15th centuries AD were as cruel as anything Rome ever perpetrated during its time of dominance. Women who were believed to be witches were targeted along with anyone suspected of heresy. So many women were tortured and executed during this time for being “witches” that it has been justifiably referred to by some historians as the “women’s holocaust.” But numbers sometimes make us numb. Perhaps the horror that the practice of scapegoating can create in people’s lives can best be captured in a specific incident. Here is the letter of Rebeca Lent, who was caught in the lethal net of the Inquisition in 1590 A.D. It stands in the way of learning and understanding and thereby blocks real solutions. It enables the persecutor to refuse responsibility for his or her own shadow – which can then act out unconsciously at will. It is unnecessarily cruel and inhuman toward the victim. The community’s possibilities for growth toward wholeness are lost. It provides a theory and a remedy that enables people to conquer feelings of helplessness when groups are faced with problems that seem overwhelming. It enables people to disown unwanted feelings or attributes. It provides a community with boundaries and identity. It provides a common enemy and thereby facilitates group cohesion. It enables groups to neutralize interpersonal and inter-group. hostilities by displacing them onto an agreed upon scapegoat. It enables people to repair an injured self esteem or overcome a stigmatized social status by pushing someone else down. It allows the leaders of a country or a group to distract its members from problems and issues that they do not want people to examine too closely. It provides employment and status to members of the bureaucracy that grows up around it. A weed that provides so many benefits is a hard one to uproot even if it poisons our individual and collective lives and may ultimately be fatal to humanity. Because it is so difficult to see the forms of scapegoating practiced by our own groups or nation, it is well to take note of some of the signs that the process is alive and well in the groups to which we are loyal. Otherwise we might ourselves be deceived. Whenever one sees in the press the use of a language that demonizes a group of people, that, by itself, is an almost sure sign that society is once again attempting to solve its problems by scapegoating. I say this for a simple reason. Whatever social norms people have violated, whatever characteristics they may have or be imputed to have, however they may threaten us or our loved ones in reality or in our imaginations, people are not monsters or demons. Nothing human is foreign to any of us. Another almost sure sign of scapegoating is the refusal to hear the stories of any individual or group of people. Their narratives are not published in the mass media. Often virtually nothing is published anywhere that gives an honest are realistic picture of who the people in a despised group really are. People say, “I just cannot understand why” this or that person or group did something. In reality this statement does not reflect so much an inability to understand, as a refusal. It is a refusal to hear and to learn and thereby to have ones assumptions challenged. We refuse to understand because we need demons. No person we understand remains a demon in our eyes. Scapegoating is grounded in judgment rather than in understanding. When scapegoating is going on, the talk takes on the shrill and sometimes hysterical tone of indignation and self-righteousness. Often a religious language is invoked to justify the condemnation of the demonized person or group. Frequently one hears the language of purification. We would like to think that “we” – all of us in the the group or nation with which we identify – have put such primitive practices behind us. We could never be like the Germans in their persecution of the Jews, the gypsies, the mentally retarded, homosexuals and the mentally ill during WWII. We have enemies, but not scapegoats. In the United States today our primary enemy is the terrorist. Surely we can all agree that terrorists are monsters. One has only to look what they do. They kill innocent people for political goals. Well, the terrorist does, in fact, kill people for political advantage. I would be the last person to condone this. But it is not true that they are monsters who are beyond our understanding. Very human reasons, that we could readily understand if we took the trouble to hear their stories, have brought the people we call terrorists to the point where they see no alternative other than violence. Human motivations are almost always understandable, and usually more easily so than we pretend. We choose not to understand. This commitment to not understanding requires at least as much energy and effort as understanding. But we have two strong reasons for this refusal. First, looking objectively at the situation may lead to the realization that in some cases the terrorist, and the group he or she represents, is in fact a victim of our collective actions. We do not wish to look at this. Second, the mechanism of projecting our own collective ruthlessness onto the terrorist helps us avoid seeing that we too kill innocent people in the pursuit of political goals. It is estimated, for example, that the U.S-supported sanctions against Iraq between 1990 and the second gulf war resulted in the deaths of about a half a million people – predominantly children. Is there any hope for uprooting this weed that crowds out so many good things that could be happening between us? What is the cure for scapegoating? As we think about strategies for reducing the amount of scapegoating that takes place in the world, it is important to begin with the understanding that the one doing the scapegoating is also not a monster. We must not allow ourselves to demonize the scapegoater. He or she genuinely wants to do what is good and is no more a monster than is the scapegoated person. The novel “The Reader” by Bernhard Schlink brought this point home to me more vividly than anything else I have read. Hanna, one of the two main characters in the novel, worked in a concentration camp at one point in her life, and is guilty of a terrible crime. Neither the profound evil of the concentration camp, nor the enormity of Hanna’s specific crime is minimized. Yet she is a very human and understandable person, and capable of real love. There is a Gary Larson cartoon sequence in which a mob is confronting the sheriff at the jail. They want to lynch the man inside. The Sheriff holds them off for them for a while, but then gives in. “Well, all right,” he says. “But this is the last time.” Many people would agree that it is not a good idea to demonize people. Yet perhaps we all cling to that one exception – the one person or group who in our minds we would willingly allow to be lynched. This may be our biggest stumbling block. Perhaps the scapegoaters are right on at least this one point: in order to struggle against the enemy in this case the practice of scapegoating – in an effective manner we must begin by cleansing our inner household. The demonization of human beings is the linchpin of all scapegoating processes. Therefore we must attack the process of demonization wherever it is found. Whatever group or person it is who is being demonized, they are human beings. These people are more like us than they are different from us. They are understandable even if we do not agree with them. This is the message we must get out. Perhaps the most effective manner of countering the demonization of people is to make their stories available. Those being scapegoated must be permitted to tell their own stories in their own way. If they do so honestly, and if their accounts are read with an open mind, they will be recognized as human. The stories of past scapegoating scandals are always popular, but every society refuses to publish the stories of its current scapegoats in a realistic manner. In every situation where it is possible, the dynamics of scapegoating must be uncovered and revealed for what they are. In this way we work to usher in the day when we are able to extricate ourselves from this quagmire – when we will stop demonizing one another, when we will seek to understand rather than judge and condemn, and when we will listen to one another’s stories with respect. Then we will begin to realize that we have everything to learn from one another. Frazer, R. The Golden Bough. [Vol 5] London, Macmillan and co., 1911. Girard, Rene. The Scapegoat. Baltimore; The Johns Hopkins University Press, 1986. Scheidlinger, Saul. “Presidential Address: On Scapegoating in Group Psychotherapy.” International Journal of Group Psychotherapy. 32, 1982, PP 131-142. Stengers, Jean, and Van Neck, Anne (translated by Hoffman, Cathryn). Masturbation: The History of a Great Terror. Palgrave, 2001. Scapegoat. Encyclopedia Britannica. Retrieved November 15, 2003, from Encyclopedia Britannica Premium Service.